I love the military community and feel very at home in it; I’m fortunate to have great military friends. But the stories of those who few who fell through the cracks haunt me, and it was their stories I wanted to shine a light on. My review of Siobhan Fallon’s short story collection, You Know When the Men Are Gone, can be found here: http://wp.me/p3EtWm-bE (published 4/27/14). What inspired you to write the stories in You Know When the Men Are Gone? Had you done any serious writing before marrying a military man and living at Fort Hood, or did the experience turn you into a writer? An army base is a strange place. An army base in a time of war is even stranger. Especially after 4000 men pack up their duffel bags, put on their uniforms, and leave their wives and children for an entire year. I wanted to show that world in my stories, from the moments that lead up to the separation, to the long and difficult absence, to the return. 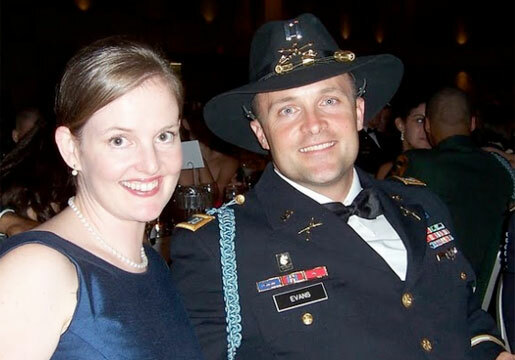 Military families are wrenched apart and expected to piece themselves together again and again. Somehow, they manage. They improvise. They take the strangeness and make it normal. Which story came to you first? When did you realize you were on to something, that the stories of the families left behind at Fort Hood needed to be told? The first story I wrote was the title story, about Meg listening through the walls and imagining what was going on in Natalya’s life. I felt a kinship to Meg and her eavesdropping; I was also listening in on the lives of those around me, paying close attention to the details, trying to weave the realities into fiction. I was a Family Readiness Group leader while I was writing most of the stories—meaning I was in charge of getting information about my husband’s company out to all the family members. He had a 160-man Infantry unit (and the Army Infantry, at least at this moment in American history, is still a job for males alone), so all of those spouses, all of those soldiers’ moms and dads, were calling and emailing me when the men were in Iraq. I suddenly had more insight into the military world than I’d ever had before. Sometimes I look back and think of all the things I ought to have done. There were some very, very young spouses with multiple children, and no husband or family around to give them a hand. A few haunt me still. I think that guilt is filtered into the title story and I didn’t even realize it while I was writing. Meg thinks she is helping Natalya but in the end she knows she could have done so much more. I was trying to capture a very specific moment in history, the “surge” of 2007—when troops were at an accelerated deployment rate. A large combined arms installation like Fort Hood was hit especially hard. One of the strengths of this collection is the strong sense of place. I could really feel the heat, the isolation, the loneliness amid the crowd, and the often desperate sense of people hanging on, waiting for their husband’s safe return. Can you talk a little about how you created that palpable sense of lives on hold? I’m a huge fan of “place.” I like to think of my settings almost as characters and try to flesh them out as such. I started to write this collection set in a nebulous, nameless base, thinking it would better represent all bases if it was never actually situated on a map. But I think it was when I finally gave in to the pressure of Fort Hood, using the road signs and firing ranges I glimpsed every day, allowing Texas to insert its horns and heat and wide swaths of land, that the stories started to come together as a true collection. Now I am writing a novel set in Jordan and I find myself eagerly reading everything I can get about Amman, wanting to capture that particular world as well. “Camp Liberty” is a particularly powerful story. It is set in Iraq, where we meet a compelling female character, interpreter Raneen Mahmood. Can you talk a little about Sergeant Moge’s internal conflict and its effect on him? As with the title story, the ending is surprising and heartbreaking yet it is entirely believable under the circumstances. Time and time again I would hear a young soldier say how much he was looking forward to “Getting Out” (which was the original title of the story, by the way). Entering the so-called real world as a civilian began to sound like an idyllic vacation in Shangri-La (especially as soldiers began to hear rumors about friends getting “stop-lossed” [having their tour of duty extended] before a deployment and being unable to leave the Army even if they wanted to). But a few minutes later, the same soldier and his buddies would start talking about Iraq or Afghanistan and I’d be struck with the excitement and vividness of their tales. None of their civilian stories had any of that heft and fire. And I couldn’t help but wonder if these soldiers really did want to be set free from the military. I’ve spent quite a few years bartending at my father’s Irish pub and have heard more than my share of veterans’ stories. And they tell their war stories as if that time of their lives was their most intense, most important. I wanted to explore that dichotomy, how a soldier has to choose between a life he might relish in a certain way (the companionship, the adrenaline, the intensity, the knowledge that you are doing something for the greater good) with the security and complacency of civilian life. Upheaval is intrinsic to military life with the constant moves and readjustments. A deployment naturally amplifies preexisting trouble in a relationship. We all know that relationships are hard work, but military spouses have the added stress of being separated for long periods of time, with the husband and wife living in worlds completely at odds with one another: America vs. a Third World war zone. “Remission” involves the domestic tension between a mother and her 14-year-old daughter. While Ellen is dealing with cancer, “wild child” Delia is struggling with the insidious effects of loneliness, abandonment issues, and anxiety about both the present and the future, although she never says anything about these problems. Are parent-child relationships on base often this complex and fraught with passive-aggressive behavior? Are a lot of kids in therapy? My eldest daughter was six months old when my husband last deployed to Iraq in 2009, and eighteen months old when he returned. So she was unable to articulate her feelings. While he was gone I tried to play a lot of video I had of him so she would be familiar with his voice and image, and I think that helped. And nowadays a lot of people can Skype regularly with their deployed soldiers, even at some of the smaller and far-flung operating bases in Afghanistan. There are also amazing tools available to military families, everything from free Sesame Street DVDs about how to help kids handle deployments, to the USO recording soldiers at their forward operating bases reading a book aloud and then sending both the DVD and the book to the families at home. Despite these efforts, I think kids might have the most difficult time; they can’t understand why a parent has left them. Kids are incredibly resilient creatures, but no matter how hard the Army or the remaining parent tries to mitigate the effects, the deployed parent is still missing a chunk of a child’s life, the birthdays and Christmases, the trips to emergency rooms and school plays. You add up multiple deployments and, well, I think it’s a tragedy. There is a great national program, Military Family Life Consultants, a service available to all of our active duty military and their family members, that has representatives at most bases across the country. It’s confidential, free, very flexible. I think there is much less of a stigma for people to ask for help these days and Military Family Life Consultants is a supportive place to turn. “The Last Stand,” “Leave” and “You Survived the War, Now Survive the Homecoming” (the fifth, sixth and seventh of the eight stories) address the return of soldiers to their wives and life at Fort Hood. They appear to be the heart of the book, when the men are no longer “gone” and assume key roles in the stories. In each story, the homecoming seems to be as difficult as the deployment, with the men fighting jealousy, family fragmentation, and phantoms from the war. Is it always difficult in one way or another, or are there some instances where the soldier’s re-integration goes well? One of my husband’s commanding officers used to say, “Deployments make strong marriages stronger.” I think the inverse can also be true. Upheaval is intrinsic to military life with the constant moves and readjustments. A deployment naturally amplifies preexisting trouble in a relationship. We all know that relationships are hard work, but military spouses have the added stress of being separated for long periods of time, with the husband and wife living in worlds completely at odds with one another: America vs. a Third World war zone. A lot can happen in a year apart, especially when communication is difficult at best. On the one hand, you have the spouse, let’s just say wife, and the person she depends on the most is suddenly gone. So she learns how to handle the household for a year. She disciplines the children, pays the bills, gets the oil changed, mows the grass. She has figured out how to manage on her own, this independence feels like an accomplishment, and she thinks her soldier will be proud of her. Then her soldier returns home and it is, of course, amazing for the first couple of weeks. But he starts paying the bills and doesn’t like how she’s balanced the check book, or thinks she’s been too soft on the kids, or wants to watch Mad Men instead of Dancing With the Stars. There is bound to be conflict. He has returned to the place he has been dreaming about, and suddenly feels like he no longer belongs, that his family doesn’t need him. The kids have changed, they have new routines, and perhaps they can’t help but resent him. And meanwhile the soldier is dealing with his own problems, the completely different life he himself has led, being surrounded by soldiers twenty-four hours a day, where he had a very specific role to play, maybe he yelled a lot to get things done, maybe he cursed like a sailor, maybe he never had to wash his hands before he ate, not to mention maybe he was constantly in danger, maybe he was wounded, maybe he saw things no one should ever have to see. And this man and woman, who have been apart for a year, leading utterly separate lives, are sleeping next to each other, sharing a bank account and the family car, helping the kiddos with homework. They have to learn to depend on each other again, knowing that in another year, they will probably go through the same cycle of separation. So ostensibly everything should be just great, the soldier is home and whole and safe, and yet there are new issues that must be dealt with, things that seem so small and unworthy after handling suicide car bombers and kidnappings, and yet these are the things that make up daily life. I think women writers might more often focus on different refractions of ‘war,’ how its effects ripple outward, touching more than the soldiers immediately in its blast area. So yes, it’s hard. But let’s not underestimate our military members or their families. Over a million U.S. troops have been deployed to the Middle East and Afghanistan since September 11th. 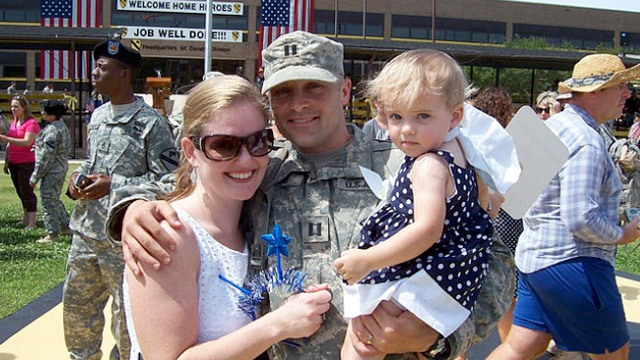 Most of them return home after multiple deployments, manage to work through any transitional difficulties, and continue being great mothers and fathers, husbands and wives. My husband deployed three times and none of them were easy; I still only hear snippets of some of his darkest moments in Iraq and Afghanistan. But we’re very happily married. I think he is a phenomenal father to our two girls. Like many military families, we weathered the storm. Your book and Helen Benedict’s Sand Queen were published in 2011; to the best of my knowledge, they were the first two books about the Iraq War written by women. Why do you think it took so long for women writers to start addressing the war? What happened to create critical mass for these two books and the flurry of others in the past few years? What do women have to say on the subject that men either don’t or simply haven’t said? I think that our access to the war in Afghanistan and Iraq has been so immediate, with embedded journalists, blogging soldiers, and a 24-hour news cycle, that, at least in the beginning, there hadn’t been the pressing need for fictionalized accounts. And, though more than a decade of America at war in the Middle East is an incredibly long time, ten years in the writing world is not. There are almost ten years between Jonathan Franzen’s The Corrections and Freedom. Lorrie Moore’s A Gate at the Stairs deals with September 11th and it didn’t come out until September 2009. Fiction, especially good fiction, can take a long time. It’s balance. Symmetry. Laura Harrington’s Alice Bliss is a novel about a teenage girl dealing with her father’s deployment. Ben Percy’s classic story “Refresh Refresh” depicts teenage boys dealing with their fathers’ deployments. Each tale is incredibly different, as different as the authors who penned them. As with anything, I think the more perspectives and differing voices we get on the topic of contemporary war can only be a good thing. How has You Know When the Men Are Gone been received by people in the military world? Any difference in the reaction of service members and spouses? For the most part, I’ve gotten very supportive feedback from service members, spouses, gold star widows, veterans, children of veterans. I’ve been invited to speak at the United States Military Academy at West Point, as well as spouse club book clubs and veteran events from NY, Washington DC, Virginia, Nebraska, Florida, and more. But I’ve also gotten a few very, very angry emails. Some spouses feel I aired “dirty laundry” and betrayed our community by not showing a more positive side to life on base. They complain that my stories are too “dark.” And I can understand that. We get the most protective about those we love most: our families, our friends, our communities. We want to always present our best to the outside world. But you also need to honor the difficulties so many families are facing by talking about it, letting the world see that there is more going on than flag waving at homecoming ceremonies. I love the military community and feel very at home in it; I’m fortunate to have great military friends. But the stories of those who few who fell through the cracks haunt me, and it was their stories I wanted to shine a light on. I was trying to capture a very specific moment in history, the “surge” of 2007—when troops were at an accelerated deployment rate. A large combined arms installation like Fort Hood was hit especially hard in a way that perhaps not all military bases or posts were hit. It was important to me to honor the sacrifices that these soldiers and spouses were making. The vast majority of Americans aren’t married to a soldier—maybe they don’t even know one. I didn’t understand military life until I married into it. So it was important for me to give an unvarnished glimpse of life behind the front gates of an Army base in a time of war. You’re currently living in the Middle East. How does the life of a military wife there compare to that life in the U.S.? It’s funny, when I live in the United States, I am very aware of being a military spouse, always carrying my military ID with me, using my husband’s Social Security number as my primary source of identification, going to military doctors for treatment or commissaries and PXs for shopping. But when I’m living abroad, I’m just aware of being an American. Here in Abu Dhabi, I’m very careful about the way I dress or interact with people. Whether it is my own megalomania or actually the truth, I tell myself that some of the people I meet, Pakistani taxi drivers, Afghani rug dealers, Emirati school teachers, haven’t met any Americans in the flesh before. Maybe they only know our country according to action films or reality TV, and I want them to see another side of us, more respectful of their ways and culture, less wanton and flagrant of our own. I have a soft spot for novels told by unreliable narrators, especially these days as I try to write my own novel narrated by a woman who may or may not have caused her closest friend’s death. I’ve recently read a few stellar books: We Are All Completely Besides Ourselves, Karen Joy Fowler (I think it is one of the best novels I have ever read. I read it twice, it was so good, and it only got better on the second reading. I immediately tracked down Fowler’s email and sent her a gushing, besotted note when I finished it. ); The Blazing World, Siri Hustvedt; The Woman Upstairs, Claire Messud; The Night Guest, Fiona McFarlane. Some of my favorite writers are Ann Patchett, Lorrie Moore, Jennifer Egan, Valerie Trueblood. All time favorite books are The End of the Affair by Graham Greene and Joan Didion’s The Book of Common Prayer. What are you working on now, and when can we look forward to reading it? I’m writing (and rewriting and rewriting again) a novel set in Jordan. It’s about two American women who become friends when their Army husbands deploy on a NATO mission. They have very different viewpoints about how to live in the Middle East, which sets off a series of miscommunications, leading to tragedy for one of them. I have no idea when I will finish the damn thing! I’m working on my third draft. I began writing it when I was living in Jordan in 2010 and it started out as a short story that just wouldn’t stop. I’m finding a novel to be such a different animal than a story. I can handle thirty pages. I can know exactly what is happening in every single moment, every gesture and snippet of dialogue, in a short story. But three hundred pages! Did my character already scratch her nose, eat hummus, mispronounce “goodbye” in Arabic? I don’t know! But, for the most part, when not feeling suicidal, I am enjoying the writing. And it helps to be living in the Middle East again as I write, to look out the window and draw inspiration from the world and culture here. Thank you for this expanded interview! “You Know When the Men Are Gone” is one of my top two books on the recent war. There’s been a lot of writing about the wars in Iraq and Afghanistan lately, and some of it feels familiar or blurs together, but Fallon’s writing always feels fresh to me. Every story in that collection had impact and I’m glad you mentioned “Camp Liberty” in particular! I can’t wait for her novel. What a wonderful interview. I loved You Know when the Men are Gone and I am looking forward to Siobhan’s next novel.